Have you found an online vendor selling Siesta Key Spiced? This was not my thing. Nutmeg and allspice is dominant. Otherwise it’s not bad, but unless I’m spiking egg nog or pumpin pie milk shakes, this isn’t a spiced rum I would keep around for cola or fruit juice mixer. I’m not much for spiced rum. A friend of mine brought a bottle of this back for me as a gift. It is very different from the usual Captain Morgan’s or other standard selling spiced rums. Very subtle and tasty, not sweet or harsh. Now I’d like to try other offerings from Siesta Key! This is the only spiced rum I drink. As a sipping rum, it has just the right amount of spice. If you want an interesting tropical flavor, try a 50-50 mix with Siesta Key Toasted Coconut Rum. This is also a great rum to use when making Coquito (Puerto Rican no-egg eggnog). Confession: Captain Morgan's Spiced was the only spiced rum I'd had before this. The difference is noticeable. I stopped drinking the Captain's Spiced because regular rum tastes better to me. With that in mind, when I first tasted Siesta Key Spiced I was surprised. I could taste actual spices. Cinnamon and clove is mostly what I taste, though now that I know honey is used I can detect that as well. I couldn't quite put my finger on that flavor. I prefer to mix my liquor so I can make drinks last (I'm not good at sipping). So far it's gone well with Sprite, Ginger Ale, Ginger Ale with a squirt of Grenadine (not Great, but not bad, either), Cranberry Cocktail, CranApple, and mulled apple cider (sinuses and sore throat get put in check with apple cider mulled with cinnamon, cloves, and allspice). I saw someone tried it with Diet A&W Root Beer - I don't think I am that brave! I'd skip Coca Cola as well. If there is a pumpkin drink somewhere this would pair nicely. Over ice or in a heated drink I'm almost always up for a sit down with this guy. Had a rum tasting on a sunny afternoon, because why not. Siesta Key Spiced bottle and label design looks like homemade. Light golden color. Super strong nutmeg to the nose and palate. Too much is too much. No burn at all most likely from the honey being used to sweeten it up. This rum has the most pronounced nutmeg flavor that I have ever tried. However, knowing what I know about the aftermath effects of nutmeg, I would not even think of drinking too much of this. A common practice on Caribbean party boats is to add lots of nutmeg to high proof rum punch. Everyone is very happy at the end of the trip and the tips flow more easily into the buckets with the tour guides grinning from ear to ear. And the next day, all of those party animals are all sick as can be with king hell headaches. This is indeed one very tasty and unique spiced rum. Just be careful on over doing it. It can be sipped neat, on the rocks, or in very exotic tropical drinks that do not include sodas. Update a few days later: Both the positive and negative effects of the nutmeg have been obliterated by whatever secret this distiller knows. I doubt that honey is the secret, but it certainly takes away from the tropical flavors, so I now dock it one point. Smooth and sweet with honey. A touch of cinnamon and nutmeg, but easy to drink neat. Soft sweet finish, enjoyable in the mouth. It got a bit cloying on my second glass, but if you like honey, then this is quite tasty. ... and I've done a lot of "research". For that guy who started on Captain Morgan in college, then grew to enjoy some of the finer things in life, this is a great way to go back to my roots. A local rum made in Florida that is hands-down my favorite spiced rum. For those critical of the sweeter rums, this one isn't for you. They don't hide the fact that they add honey with the spices before aging, but the final result is worth it. You can pick out the honey, clove, and nutmeg, and at 70% abv, it's pretty smooth. Use in anything you would have used the Cap'n to kick it up a notch. I like it with Coke and lime. Tasty spiced rum from Florida. Very good choice especially for low $$ . Strong pumpkin spices along with cinnamon, ginger, nutmeg, and allspice. Finished with some vanilla and honey. Sweet but not overly sweet and still maintains a natural taste unlike some spiced rums. I still prefer Brinley Shipwreck Gold but this is most definitely worth keeping on hand . Nice spiced rum. Good flavor. Didn’t enjoy as a sipping rum, but really liked with some A&W Diet Root Beer. Superbly drinkable, like a gingerbread cookie in a glass. One of the best spiced rums I have had. You don't even have to drink it, just smell it. This was pretty good stuff. It's easy on the nose and tastes great. Not much burn very smooth and can be enjoyed neat or mixed. Picked this up while visiting Siesta Key and really enjoy having this in my collection. Spiced rums are supposed to be dark and brooding, with an excessively vast spice bouquet that works together with a high proof to beat your tastebuds into submission! They're dominated by vanilla, added molasses and most improtantly: alcohol! As if this wasn't made clear, this is a super pleasant rumOH GOSH NO I mean this rum is weak, and light, and is perfect for adding a spice kick to your drinksDANG IT! It can't even ramp up your cocktails ABV while adding some depthGAHH! Ok, the jig is up... This is far and away the most friendly and tasty of the spiced rums I've had! This stuff is a steal at only $25, and it is so darn drinkable! Great spiced rum with notes of butterscotch, caramel, and cinnamon. A wonderful rum from the Sunshine State with a rich nutmeg flavor that goes down smooth. Some people say its nutmeg tone is a little on the harsh side, but I think it's just right. I would highly recommend this for everyone's rum collection as it's a great rum that can be easily sourced by searching the Siesta Key website. This is definitely the rum I have in my cabinet representing the good old USA. Wow. It's not often that you find a spiced rum that hasn't been sugared beyond reason. This one is definitely not too sweet. That's the good news. The less-good news is that it has more nutmeg than a spice hut in the Banda Islands. In other words, too much. Nevertheless, it has garnered some great reviews here. Maybe it's me. Actually, with all the extra nutmeg, this rum might shine in a Painkiller. Definitely worth a try. Take my humble word, and buy it. Incredibly priced. Flavor is unearthly. Small batch, Florida grown ingredients. Sipping quality or epic mixer. All of the fall spices are present, with cinnamon and nutmeg up front. Eggnog and coffee based drinks should work well, probably works well in food recipes too. Smelling this instantly reminded me of pumpkin pie! It's actually ok for a flavored rum, and I think pumpkin pie goes a lot better with rum than some of the other flavors I've tried (grape, lemon, etc). Still, I'm not as big a fan of the flavored rums as I am the traditional aged rums. Kind of ironic that I try this spiced rum less than a week before Thanksgiving. It definitely smells and tastes of pumpkin spice (nice nutmeg). Very smooth rum with good after-warmth. Never a harsh burn. Thanksgiving is the perfect time to use this as a sipping rum and in Thanksgiving-themed mixers. Pumpkin punch anyone? Doesn't work as well in colas IMHO but does make for a unique combination. 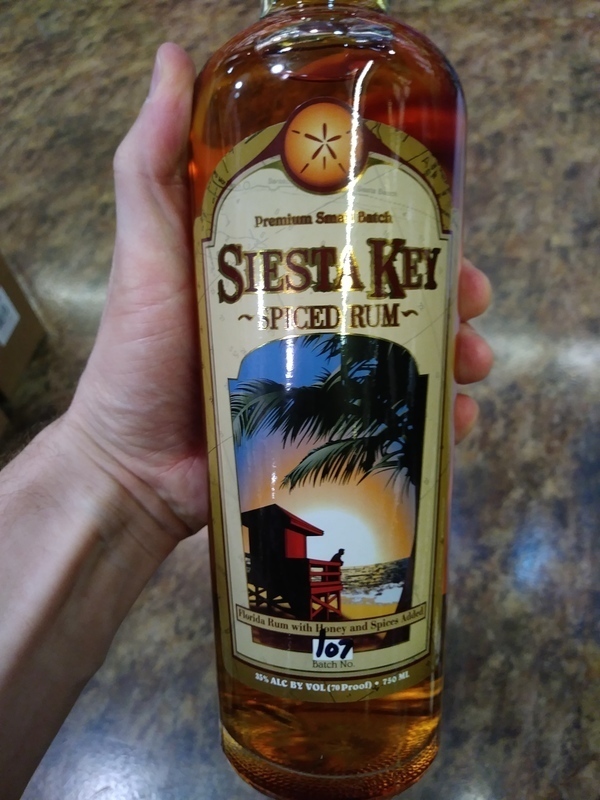 Siesta Key rum is made in small batches at a family-run distillery in Sarasota, Florida which happens to be about 12 miles from Siesta Key, Florida (initially I erroneously thought Siesta Key was somewhere between Miami and Key West). This rum has won awards and I understand why. Very good stuff. From the moment the bottle is lifted, until the last golden droplet has slowly slid down the tumbler and into your mouth... You know that there is something different. I have enjoyed a fair number of rums from around the world after many years of temporary assignments and this is one of the few that quite simply exceptional. The aroma is that soft gingerbread, brown sugar, slight vanilla and soft spirit that is that of the siren calling one to come hither and enjoy. The flavors are soft, subtitle, yet if one is patient you will begin to taste the various layers and notes, followed by a finish that is absent the harsh burn of some other rums. This stuff is wicked....good... and you will want more. This rum must be the rum that several of the beach bum musicians wrote about and will undoubtably lead to many more creative inspirations. There are several other specialty bottles that are made/released in limited productions and they are well worth the effort if you can find them. This distillery is located in Sarasota, Florida and well worth the trip. Try the others selection from Siesta Key... You will not be disappointed, but this is my favorite. good mixed with coke although does have a strong honey and spice aftertaste. While I'm not a big fan of spiced rums, this one is the best I've tried. It's made with all natural spices, not as sweet as other spiced rums and the flavor reminded me a little of ginger bread. I've rated this among all the rums I've tried but if I were to rate spiced rums on their own, I'd give this a solid 10. My friend who shared it with me said he made egg nog with it that turned out great.